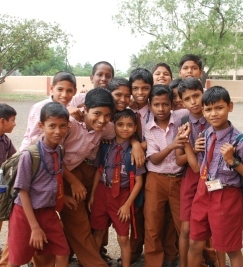 NSICT’s contribution to the Veer Wajekar School and College in Phunde is its commitment to corporate social responsibility for the children of the eighteen villages of Nhava and Sheva. DP World’s contribution at over Rs.4 crores, and its support have enabled the construction of a new school building, a college building and a multi-purpose hall, spread over 12000 sq.mtrs , the project comprises a school building, a college building and a multi-purpose hall. NSICT has been the catalyst for Public-Private partnerships in the maritime sector. It has been unwilling to relinquish its lead as India’s first private container but raising the bar in operational parameters. Unfazed by competition, defiant in the financially challenging scenario, India’s flag flies high atop NSICT’s performance. We endeavour to become an enabler in those communities by involving ourselves in projects and initiatives that will raise awareness, tackle social issues and make a difference.